According to City Leaders, Piedmont is THE up and coming place to live in Oklahoma. Our community is rich in history with a planned focus for business and community development. People are drawn to Piedmont because of our friendly small-town atmosphere in a suburban location with OKC just minutes away. Piedmont schools are one of the top performing districts in the State with a history of academic excellence and a variety of extra-curricular activities including an award winning band. The City of Piedmont was founded on land homesteaded by Mr. James Dean during the Unassigned Land Run of April 22, 1889. 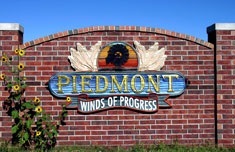 By 1910, Piedmont had matured into a prosperous town with a population of 255. The residents of Piedmont stood firm through The Depression of the 1930's, World War II, and post war recovery of the 1940's. Piedmont began to grow in the 1950's, 1960's, and 1970's with its population booming by 124%. Canadian County gained the reputation of a "low risk" oil and gas exploration area and oil rigs sprang up all over the town of Piedmont. The city also ranked high in agriculture and livestock production statistics during the 1970's. Piedmont continued to grow in the 1980's but not at the dynamic rate of the 1970's. However, a major transportation link was constructed to the Northwest Highway corridor with the four lane development of State Highway 4 through the center of the city. Piedmont has seen tremendous growth since 1990 in which its population has more than doubled. Since 2000, Piedmont has added a public library with an advanced internet "hot spot" and its own new fully staffed professional medical center and clinic. Today, Piedmont is a modern Home Rule City which is served by a Council-Manager Government. The city has fire insurance rating of 7-9 and full time staff of 11 police officers. Ambulance service is provided to Mercy Regional Medical Center. Accessing emergency services is as easy as dialing 911.